Aluminum is the material of choice for a wide range of products in many different industries. You’ll find aluminum in everything from automobiles and trucks to computers and consumer goods, where it offers an ideal combination of light weight, exceptional durability, low cost and environmental friendliness. At Pennex Aluminum Company, our goal is to be your one-stop shop for aluminum extrusion profiles and fabricated, finished aluminum components, all manufactured from our own internally supplied cast aluminum billet. As a member of the Metal Exchange Corporation — one of the largest suppliers, processors and traders of non-ferrous metals in the world — we combine the resources of a large company with the customer-first focus of a small business. From our Wellsville, PA headquarters, we provide dedicated service and deep expertise to all our customers. Aluminum billet: Aluminum cast billet services are provided at our Wellsville and Greenville facilities. There, we are able to produce 7”, 8”, 9”, 10″, 12″ and 14” diameter billet in 1xxx, 2xxx and 6xxx series aluminum alloys. Our state-of-the-art facility is IATF 16949:2016 certified, ensuring measureable quality control standards are in place at all steps of the remelt and casting process. Reliability, flexibility and short lead times are hallmarks of the Cast Products Division. Aluminum extrusion: Aluminum extrusion products are produced in our Wellsville and Leetonia facilities. Our wide ranging capabilities allow us to meet a variety of customer demands from large sizes and tight tolerances to custom alloys and enhanced mechanical properties. Our extensive catalog of standard shapes is complemented by our in-house design and engineering capabilities, through which we can customize or modify a product to better suit your requirements. 7”, 8”, 9” and 12” press sizes. Capability to extrude out to 16” wide. Aluminum fabrication: Our full-service fabrication capabilities make us the clear value leader among aluminum extrusion manufacturers. We can quickly turn around aluminum fabrication projects with an exceptionally high degree of quality. Services we offer include CNC machining, precision cutting, miter cutting, punching, notching, bending, welding, deburring, component assembly, painting and finishing, and more. Read more about our core divisions by following the links on this page. Transportation: Truck body, truck trailer and other transportation related manufacturers frequently turn to extruded aluminum components for vehicle bodies, frames, ramps, lift gates, knurled flooring and other components. Automotive: Aluminum is used extensively in the automotive industry, where it plays a key role in fulfilling manufacturers’ ongoing requirements for strong and lightweight components. 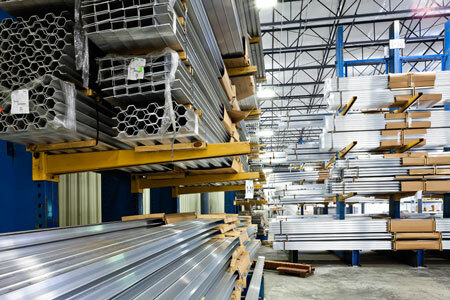 Building & Construction: Aluminum alloys can be found in concrete forms, door and window frames, fences, decks, rails and other residential and commercial construction products. With its ability to withstand the elements and corrosion resistance, aluminum is a smart choice for both indoor and outdoor use. Consumer goods: Aluminum’s high predictability and light weight make it a good choice for appliances, sporting goods, computers, and other consumer products. Other markets we serve include the electric power industry, solar and wind power, distribution and more. To discuss an upcoming project and to find out how we can help, contact the Pennex Aluminum Company head office by phone or email today.